Mary Louise Bringle, who chairs the Presbyterian Committee on Congregational Songs, told the Christian Century that the committee had discovered the hymn’s lyrics had been revised to say, “The love of God was magnified,” without the authors’ permission. According to Bringle, when the PCUSA group sought permission from Getty and Townend they were denied. 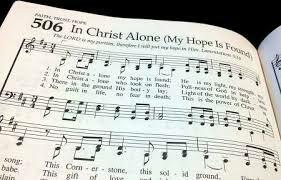 The authors of the hymn insisted on the original wording, and the Committee then voted nine to six that “In Christ Alone” would not be in their new hymnal. The committee decided “it would do a disservice to this educational mission [of the new hymnal] to perpetuate … the view that the cross is primarily about God’s need to assuage God’s anger,” Bringle wrote. Russell D. Moore responded to the song’s rejection in an editorial for The Washington Post. “As an evangelical, I would argue that it’s necessary to sing about the wrath of God,” Moore, president of the Southern Baptist Ethics & Religious Liberty Commission, wrote. Boyce College professor Denny Burk was not surprised that the PCUSA found the hymn controversial. Once again the unthinkable has happened. Yet this is the way we now think of the world since 9/11. 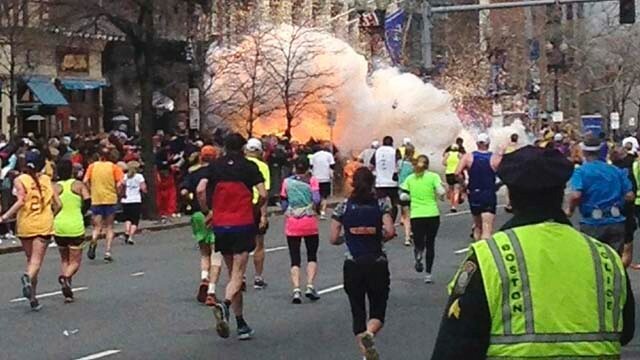 Another beautiful day ripped apart by explosions that tore the lives of innocent bystanders. Unthinkable. Shameful. Treacherous. There is a word for this: treachery. But what do you do on the other side of the terrorist’s attack? What can we say in the face of pure treachery? We too have seen “treachery without excuse.” But how can we respond? The most important thing for us to do is to turn to God. We pray “To you, O LORD, I lift up my soul” because there is no one else to whom we can lift up our souls. There is no one else who is “good and upright” as it says in verse 8, “loving and faithful” (verse 10).” Only God can “rescue”; he is our only “refuge” (verse 20). In Psalm 25 there are three things David asked of God: God, please guide me, please forgive me, and please protect me. So first, we must ask God to guide us. Verse 5 says “guide me in your truth and teach me, for you are God my Savior, and my hope is in you all day long.” And verse 9 says “He guides the humble in what is right and teaches them his way.” We desperately need God’s guidance to help us know how to respond wisely. Treachery is not just an issue of international conflicts and terrorist attacks. Treachery happens in our own streets every day. It happens behind the closed doors of homes that seem peaceful, but are the scenes of unreported crimes and other cruelties. Many people are wondering now what to do with their anger when there is another brutal assault. There are things we can do. Anger is an inbuilt instinct designed to move us to action in the face of danger and injustice. It produces a hot energy. That heat can harm or it can work. It may turn into an anxiety that renders us sleepless or irritable, or mean-spirited. But there is an alternative. The anger you and I experience needs to be transformed into the energy of a driving engine, not the eruption of a volcano. What we can do is to turn that energy into resolve. Resolve is firm purpose. It is thoughtful, calculated, passionate commitment to a good cause with constructive ends in mind. This is a time to face treachery wherever we find it. True faith is the issue for today. We live in an age when people say, “it doesn’t matter what you believe, as long as you are sincere.” But let’s consider this chilling fact: those terrorists who tie their evil cause to some kind of religion as in 9/11 are acting out of a belief system. They sincerely believe that God would send them straight to heaven at the moment of their treachery. There is true faith, and there is false faith. The true God is Love and Truth and Justice. Everything about the true God stands against treachery in any form. What? Why pray for forgiveness at a time when you’re a victim? David was being chased down by vicious and shameful enemies. Why should a beaten-up man pray for forgiveness? David did so because he was a very wise man. He knew that—even when he was face to face with treachery—he needed to keep praying a humble prayer of forgiveness because that is the only way to keep your heart soft enough for God to shape it, the only way not to become bitter, or vengeful, or self-righteous, or (worst of all), treacherous. If you are struggling with fear right now, it is important to keep a sense of perspective. On a week like this it is like we are taking a telescope and looking at one part of the world where awful things have happened. But this is not just a quick glance in a telescope; it is video tape being rolled through again and again and again. The fact of the matter is, in the real world there is not a bomb on every corner. Thousands of planes take off and land safely every day. One of the great realities of life is called the “common grace” of God. The sun rises every day, the rains water the earth and bring forth the crops we eat, children get on buses and go to school and return home at the end of the day, bankers and teachers and check-out clerks and computer technicians go to work every normal day. Kids play ball outside and the worst thing that happens is a scraped knee. This is the way things are in “the normal.” The abnormal and rare events of treachery put us on alert, and make us more responsible, but no one can ruin, no one can abolish, the common grace of God. Out of the rubble of tragedies always come opportunities. We need to open our eyes to the many redemptive opportunities that lie ahead in the weeks, months, and years to come. We have an opportunity whenever we face treachery to be more compassionate toward the rest of the world. In some ways our country since 9/11 joined with people all over the world who suffer at the hands of treachery. If we join with others who suffer, seeking a compassionate understanding of their plight, we will be morally enriched because we will be seeing the world the way God sees the world. We have an opportunity when we face treachery to act like a more unified country. Wouldn’t it be a blessing if we lost some of our interest in the trivial, and deal with issues that really matter in life? Wouldn’t it be wonderful if multitudes of people realized that their lives will have fuller meaning if they are participants in and promoters of God’s goodness, instead of just trying to make it to their retirement years in comfort. We have an opportunity when we face treachery to find faith in a deeper way, and to help others who don’t have any idea where to turn spiritually. We have an opportunity when we face treachery to understand the mission of the church in a deeper way than we have in the past. The Bible does portray this world as a battleground between good and evil. But what are the weapons of such a battle? While national governments now plan how to wage a war on terrorism, the church should remind itself of its universal call to proclaim the heart-changing message of Christ in every corner of the world. If someone could disarm every ill-intentioned person in the world, that would still not bring peace and righteousness. Only God can do that, one person at a time he does that, and we have the immense privilege as the church to be involved in that mission. The cowards who practice treachery want us to feel like victims or to turn us into the monsters that they are. It is up to us whether we let them. Follow along with The Influence Project. MICAH 7:9 In football, if you’re good, chances are better than 90% that you’ll finish the season with a loss. Each year in the NFL, 12 teams make the playoffs, but only one wins the championship. Champions spend the offseason reveling in glory and reliving the victory. The other 11 teams often spend the offseason rehashing the mistakes and reliving the disappointment. Or, at least, trying not to. It’s actually different for the not-so-good teams. They had time to come to grips with their mediocrity. Midway through the season, most of them knew this wouldn’t be their year. But the teams that make it to the post season keep their hopes alive until that final loss. And it’s often a last-minute, heart-breaking loss. That’s the price you pay for being good. Great teams and/or great players can’t win every championship. But they often get close, and those are the losses that really hurt. That’s why those those who reach for greatness suffer losses that the run-of-the-mill can’t fathom. It’s the same with you. If you seek to be among the best, you will also suffer setbacks bigger than the rest. Which do you think hurts more: losing the contract you worked so hard to win … not getting the promotion you worked so hard to earn … failing to reach the out-of-reach goal you set for yourself … or … watching your favorite contestant get voted off the island? Which hurts more? Which one do you aspire to be? You’ve heard all your life that only those who dare to dream big can achieve big. That’s true. The flip side is that those who dare to dream big also get hurt big. You face bigger setbacks and feel bigger disappointments. It’s all part of the quest to accomplish something worthwhile with your life. WHEN THE SEASON ENDS TOO SOON. Do not gloat over me, my enemy! Though I have fallen, I will rise. Maybe once or twice you’ve had a season end too soon. We all have. The good news is that there’s always a season to come. God is bringing it your way. 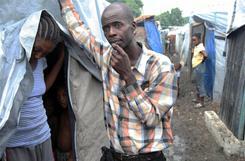 Joel Sainton visits Silly Remercile and her two small children in their tent in Carrefour, Port-au-Prince. PORT-AU-PRINCE, Haiti — Much has been damaged by the earthquake that struck Haiti last January. Much has changed for so many people.But some things remain constant. Joel Sainton will get up each morning prepared to walk for miles, visiting people with HIV, the virus that causes AIDS. He will sit with those who are not feeling well, sing, pray and counsel. If he has money or food to give them, he will. If he needs to refer them to a clinic, he does.Sainton calls these people his “congregation,” but he has no actual church. Instead, he leads a group called APIA (Association of People Infected and Affected by HIV/AIDS) that serves people who are HIV-positive and those with family members who are living with or have died from the disease. More than 200 of them have registered with his non-governmental organization for moral, spiritual and material support as they deal, mostly in secret, with the illness.Sainton, a 38-year-old itinerant minister, is a member of the Pentecostal Church of God, one of a growing number of working-class evangelical churches challenging the dominance of the Catholic Church in Haiti. He is tall and slim, a man who moves with the contemplative gestures of someone conserving his energy — as if he knows just how much energy he has to expend to get through a day in the Haitian heat, and how little food he will have in his system.On a recent Saturday morning, Sainton presides over a gathering of people living with HIV/AIDS, held on the landing outside the one-room apartment he shares with his sister, in a badly damaged building in Carrefour.The road to the house is rocky, full of bricks and large clumps of cement, rubble from the houses that once lined the route. The building smells faintly of urine and cooking food. About 15 people sit in folding chairs and a few formal chairs. There are two men, two teenage boys with their mother. The rest are women of various ages.The meeting begins with a short devotional led by Sainton. He is animated, filled with contagious energy and joy. He calls on people by name, and nudges them to share their experiences. “Sister, you just went through a hard time, but God has made you better, eh?” he says, smiling at a middle-aged woman who tells a brief story of sickness and God’s mercy and the son who cared for her.Drawing out the closed-in One young woman looks stern, unengaged. Sainton suggests she must be having boyfriend problems. A soft smile creeps into her face, and she insists she does not have a boyfriend. She says she is in pain — deep pain inside her body.The testifying goes on. Those present listen and groan in agreement and understanding.These HIV-positive people speak with an unusually sophisticated knowledge of the technical matters of their health. Without warning or prompting, they announce their CD4 counts, indicating the level of white blood cells in their bloodstream. This number is critical: A count of less than 200 is diagnosed as AIDS. (The average person has a count of more than 1,000.) Here, the numbers range from 250 to 1,200; the gathering offers praise and supportive words, depending upon the count.Illness hits close to home In 2003, a year and a half after his wedding, Sainton’s wife became ill and was hospitalized. She tested positive for HIV. He took the test, too, and tested positive. The news, he says, came as a shock.At the time, Sainton was in training to become the pastor of a congregation. He was full of ambition and faith in God for the work before him.The reaction of church leaders, however, was something he did not expect. “They said my wife was a criminal. They said give her back to her parents right away. I said no, we got married for life. They said they received the order from God to put my wife out of the house.”Sainton refused and was ousted from the leadership.Eventually, the sickness took its toll on his marriage: His wife left him. He says he is still married to her and would never consider marrying anyone else. But his devotion now is to his work.Sainton’s APIA was formed out of a need he felt as a Christian with HIV. He recalls his unease at a party in 2004, hosted by one of the HIV/AIDS agencies that had helped him. “They were playing music, and everyone was dancing — but I did not feel comfortable with that,” he says, shaking his head and smiling. “The way I felt so bad, that is the same that other Christians that have been infected (would feel).”So he decided to form a Christian network to reach out to those suspected of being HIV-positive, get them tested, then help those found to have the disease. The organization serves everyone, he says, regardless of faith.”Organization” overstates what is at best a hand-to-mouth operation. For the most part, Sainton says, he relies on gifts from individuals and the occasional offering when he preaches at one of the many churches throughout Carrefour.”Grass-roots organizers like Joel Sainton are the thread that holds the torn fabric of society together when the state does not or cannot provide for its people,” says Leonard Doyle, spokesman for the International Organization for Migration in Haiti. “This is how Haitian society has always worked, but the problems the country faces are much more severe since the earthquake.”Before the meeting begins, Sainton quietly explains that this gathering will be short. Normally, he serves refreshments, as many come hungry and walk great distances to get here. But he does not have any money this week.It ends with the reciting of the 21st Psalm and the Lord’s Prayer. Sainton embraces the members with fervor and laughter, teasing this one and laughing with that one. He thanks them for coming. Stay in the faith, he says. Take your medication. Try to be strong.A question, and an answer Eventually, he is alone. He takes a seat and his body becomes deflated. His lively eyes grow sunken, and his fatigue is palpable. He is no longer “on.” He no longer needs to be the physical embodiment of resilience and encouragement. He speaks slowly, almost haltingly. “Yes, I am tired. I am very tired.”Faced with the overwhelming needs of those he serves and his inability to do more, he says he sometimes despairs. But the work sustains him because he believes this is a calling. His faith is intense, at times irrational, but always a source of reassurance and peace for him.Once, he says, he asked God why he had been given such burdens to bear. ” ‘You gave me the ability to talk to others, how can you let me get caught in that trap? Tell me what I have done that made this thing happen.’ And God answered me, ‘Did Job sin?’ ” — a reference to the pious biblical figure who loses his health, his wealth and his children. “He wanted to show me that he needed Job to accomplish the mission. So I came to understand that I had a mission.”Sainton is facing eviction from his room (the building is marked for repairs) and has no idea where he is going to move. He is leaving it in God’s hands. He is waiting for miracles — to help him find food for himself and his sister and his two adopted children, to find food for his extended congregation. Most of them are displaced, most of them are hungry, most of them are struggling with the challenges of being HIV-positive in a time of cholera.Most of them, he says, are worse off than he.Kwame Dawes, a professor of English at the University of South Carolina, made four trips to Haiti after the Jan. 12 earthquake on a grant from the Pulitzer Center on Crisis Reporting, an independent, non-profit group in Washington. USA TODAY editors worked with him in preparing this story. His poems about Joel Sainton and other Haitians can be found at pulitzercenter.org. Amazing Timelapse Video of the Recent Blizzard in New Jersey. Why is fruitcake the grown-up version of coal in your stocking? “Most of them are just leaden,” says Southern cooking expert Jean Anderson, who wrote the forward to the recently rereleased cookbook “Fruitcake, Heirloom Recipes and Memories of Truman Capote and Cousin Sook” (University of North Carolina Press, 2010). It was Marie Rudisill, aunt to the famed Southern author of “Breakfast at Tiffany’s” and “In Cold Blood,” who originally produced the slim volume “Fruitcake” in 2000 by culling numerous variations on the theme from a 19th century family journal. Though the text has been updated, the book remains stuffed with nostalgia. There’s dark fruitcake, light fruitcake, fruitcake with coconut, pineapple or currants. Fruitcake stuffed with walnuts, pecans or almonds, fruitcake featuring only golden raisins. Fruitcake soaked in grape juice, sherry, rum or brandy. Rudisill even included a flaming fruitcake. Regardless of the variety, good fruitcake — and yes, there is such a thing — abides by certain rules. It should be moist, but not wet, Anderson says. It can be hefty, but not brick-like. A good fruitcake also is balanced with a pleasing blend of fruit, nuts and anything else you’re using, says Berta Lou Scott, co-founder of North Carolina-based Southern Supreme Fruitcake Company. During baking, rotate the cake every 15 minutes, Scott says, and don’t overcook it. In the book, Rudisill suggests placing a shallow pan of hot water in the oven during baking. Balance your fruit, nuts and other components. “You can put so much fruit in it that fruit is all you taste,” Scott says. Make the cakes at least four to six weeks in advance, Rudisill suggests. This gives the flavors plenty of time to develop. Rudisill suggests wrapping the cakes in a brandy, wine or juice soaked cloth and moistening it once a week. But Scott warns against a heavy hand with the booze. “If they like their bourbon, I tell them to drink their bourbon with the cake,” Scott says. Fruitcakes slice best when refrigerated, Rudisill writes, so make sure the cake is cold when you cut it. Use a straight-edged, thin bladed knife and dip it into hot water before cutting with a slow, sawing motion. SAN JOSE MINE, Chile — The oldest of the 33 miners, Mario Gomez, has been freed from his underground prison. He dropped to his knees and bowed his head in prayer, clutching the Chilean flag. The 63-year-old Gomez was pulled up from the ground and embraced by his wife, Lilianete Ramirez. He is the most experienced of the group, first entering a mine shaft to work at the age of 12. Gomez has silicosis, a lung disease common to miners. He has been on antibiotics and bronchial inflammation medicine. SAN JOSE MINE, Chile (AFP) – The operation to bring 33 Chilean miners trapped underground for more than two months back to the surface neared its final stage Monday as engineers worked to reinforce a shaft through which the workers will be hoisted. Mining Minister Laurence Golborne told reporters the men could begin the ascent, one by one, on Wednesday. After the shaft in secured, workers will install a metal cage and a complex pulley system needed to lower the cage to the miners and lift them out. Each miner will be pulled up 622 meters (2,040 feet) for one and a half to two hours in a container barely wider than a man’s shoulders. The first group of miners to exit will be several of the strongest men, followed by a group considered the weakest due to chronic health problems like high blood pressure or lung ailments, and ending with more of the stronger ones, officials said. If the timetable holds, all the miners could expect to end their ordeal of nearly two and half months by Friday. They have been trapped deep beneath the desert floor in a chamber the size of a living room after a partial collapse that blocked the mine exit on August 5, surviving longer than anyone has before under similar circumstances. For weeks the men were feared dead. But on August 22 they attached a note to a drill bit that had broken through to the chamber where they had taken shelter, saying they were all alive, well and awaiting rescue. Health Minister Jaime Manalich told a press conference near the San Jose gold and copper mine in northern Chile on Sunday that he had already discussed with the miners the details of the operation. By being able to put aside their needs and wanting their colleagues to have a chance at freedom and fresh air first, “they have had a really commendable spirit, of solidarity and commitment to their friends,” Manalich stressed. In addition “they are mature people and very self-sufficient people, who have been able to face a test the likes of which probably no one has in human history,” Manalich said. The miners will begin a special liquid diet about 12 hours ahead of the rescue operation expected to start Wednesday.The aim is to reduce any nausea and vomiting during their removal from the depths of the mine, while still keeping up their caloric intake. Engineers, meanwhile, were reinforcing the shaft that will be used to finally free the men. Gerardo Jofre, head of the board of Chile’s state copper giant Codelco, maintained that the rescue effort has put Chile at the forefront of such operations. The deep shaft to the emergency shelter where the men have survived was completed on Saturday. Meanwhile, hundreds of journalists and camera crews from around the world have converged on the mine, hoping to capture the first images of the miners at the surface. Among the topics covered in the survey were: Where was Jesus born? What is Ramadan? Whose writings inspired the Protestant Reformation? Which Biblical figure led the exodus from Egypt? What religion is the Dalai Lama? Joseph Smith? Mother Theresa? In most cases, the format was multiple choice. The question about Maimonides was the one that the fewest people answered correctly. But 51 percent knew that Joseph Smith was Mormon, and 82 percent knew that Mother Theresa was Roman Catholic.